La Bella Review and Product Giveaway! It was just National Hispanic Heritage Month (9/15-10/15) and the brand La Bella is celebrating Hispanic American culture and Latin beauty. For years, Latinas have used unique beauty tips, tricks, and products to keep their hair and skin looking gorgeous. La Bella – the ultimate beauty secret among Latinas – provides superior styling, hair and skin care products to help all types of women looking flawless. Anti-Sponge Shampoo and Conditioner ($3.99 each, 25.4 fl. 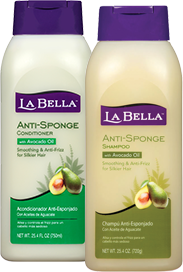 oz in bottle) — For luscious locks, wash and hydrate your hair with La Bella® Anti-Sponge Shampoo and Conditioner which are enriched with unique blend of Vitamins B5, E and C, Avocado Oil and Quinoa Protein that have authentic Latin roots known to keep your hair looking beautiful. What I think: First of all, this is an excellent value. You get a huge size of shampoo and/or for under $4 each! Both products are very creamy and have a fruity scent. I find that a little goes a long way with the conditioner, because it is so moisturizing! I did notice that my hair is smoother after use. La Bella Super Shine Polishing Serum ($5.49 USD) — For polished bouncy hair, use La Bella Super Shine Polishing Serum! It provides heat protection while enhancing shine and leaves hair controllable smooth and shiny with its lightweight and alcohol-free formula. What I think: I like to use this on my hair after blow drying it. It usually is a little dry and frizzy afterward. A little of this serum rubbed between my palms and applied to my hair restores shine and bounce! 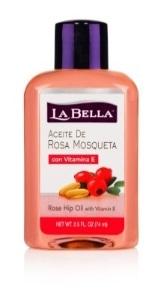 La Bella Rose Hip Oil with Vitamin E ($4.99 USD) — For smooth, wrinkle-free skin, try La Bella Rose Hip Oil and Vitamin E! It contain antioxidants, moisturizing properties and nutritional factors to rehydrate and rejuvenate skin and works to regenerate damaged skin tissue to reduce scars, stretch marks and skin spots. What I think: This oil hydrates so well! I like to use it on my hands and elbows. I have begun applying it to stretch marks and we will see how well it works! It also smells really nice, like a musky floral. The only thing I think needs improvement is the bottle. It needs a better pouring method as it is just open and if it spills, it will get everywhere. 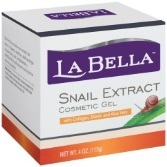 La Bella Cosmetic Gel with Snail Extract ($7.49 USD) — For soft, rejuvenated skin, La Bella Cosmetic Gel with Snail Extract works to restore damaged tissue, hydrate skin, improve the appearance of fine lines and reduce inflammation, redness and pigmentation with natural acids and proteins. What I think: I am a little squeamish when it comes to snail extract, even though it is supposed to be a skincare wonder. I tried it on the back of my hand and found that it dried down quickly and left my skin very soft. I might have to try it on my face now to see if it helps with my fine lines and redness. Now to the Giveaway! This is open to residents of the United States only. The prize is all five of the items reviewed above! To enter, please leave a comment below. For an extra entry, follow me on Twitter (@fortyflirtyfab) and share this post on Twitter. Please tag me in your post so that I can see it and I will definitely follow you back! Good Luck! I will choose the winner by random on Monday, November 2nd! It is! Good luck in the giveaway! That’s a very good deal for the shampoo and conditioner. Sounds like the serum is a great product to leave your hair very shiny. It is! And you get a lot for the money!